Believe it or not, this Sunday is the beginning of Advent. This is the season in the Christian calendar where we anticipate the celebration of Jesus’ birth. For the four Sundays before Christmas, Christians all over the world take time to ponder, wait, and prepare themselves for the celebrations that the holiday season brings. There are so many different traditions surrounding Advent. When I was a child, my family and I would gather together on Sunday evenings with a wreath and four candles (one for each Advent Sunday). We would light the candles and sing a German song about the coming of Jesus. We would eat Christmas treats and do a devotional together. Of course as kids we did it begrudgingly, but now it’s become part my own family tradition. But why take time for Advent? Why not just celebrate Christmas when it comes on December 25th? Well, let me give you at least four reasons why I believe Advent is important to help us experience Christmas as individuals and as churches. Advent is actually the beginning of the liturgical year. It’s not January 1st, but rather four Sundays before Christmas Day that marks the start of the Church calendar. It’s the time when we remember that Christ was made known to the world. Remember that Jesus didn’t just float down from heaven on the day of His birth, but was announced to Mary, Joseph, and a whole host of interesting characters. For many generations, Israel awaited the coming of someone who would provide freedom and deliverance for them. At a specific point in history, it was made known that that person was actually coming. In some ways, this is when the Christian faith began. Advent reminds us that the incarnation of God is the most significant part of our history. When we observe Advent, we take the time to sit with the story of Christ’s coming. So often the Christian faith gets boiled down to a personal relationship with Christ. Not that this is incorrect, but faith is more than just an individual’s singular, personal fulfilment. It’s not only about one person’s story, but rather how each of us fits into the story of God. Advent is a season when we remember the larger story of God’s plan for this world. As soon as humanity decided to walk away from God, the rift between us was evident. After that moment, our history became full of deceit, death, oppression, violence, war, selfishness, and hate. God saw all of that, but instead of giving up on us, He put a plan in motion to redeem and transform the world. That plan, which centres around Jesus, includes all people - past, present, and future. Before Christ, Israel, and all of creation, longed for the fulfillment of God’s plan. The covenants they made with God were a preview of what was to come when He would send His own son to redefine what it meant to be a part of His family. They waited and waited, but many of them never saw the coming of the Messiah. When we celebrate Advent, we realize what it was like for our fore-bearers to wait for the coming of the Messiah. That anticipation prepares our hearts to receive and appreciate Christmas Day all the more. Although we don’t always act like it, we need to remind ourselves that we are still a people in anticipation. Although Jesus has come and the kingdom of God is here, it’s not yet here in full. Although we see God at work all around us, we also continue to see the effects of evil in this world. But God’s story isn’t over. Jesus promised that He’s coming again to fulfill God’s plan, to renew all of creation, and to give us new life. The gospel isn’t just about going to heaven when we die. It’s about God restoring and transforming us through resurrection. That’s the most amazing thing we could ever anticipate. As we observe Advent, we not only remember Jesus’ coming as a baby in a manger, but look forward to Jesus’ second coming as a king who will bring peace to His creation. We are reminded that we’re a waiting people, standing together with Christians all around the world. It seems like as soon as Halloween is over, the commercialization of Christmas begins. This morning I passed a house that had it’s lawn covered with Christmas decorations: Santa, reindeer, snowmen, and of course, a Christmas dinosaur! It’s almost impossible to escape what Christmas has become in Canada in 2018. Of course there are many great things that our society recognizes in some way; themes of giving, spending time with family, and peace on earth can still be found in popular culture. But it’s often hard to focus on Jesus on Christmas Day when we’ve been inundated with countless renditions of Frosty the Snowman and Jingle Bells for over a month. Celebrating Advent helps us. It gives us a marker each week where we can pause from the business of shopping and family gatherings to remind ourselves of what we are actually celebrating this season. So why not give it a try? Light a candle, sing a carol, read the stories of the coming of Jesus. But whatever you do, pause each Sunday (or day) in Advent. Take time during one of the most hectic seasons to reflect on Christ’s birth and the hope we have in His return. There are so many great resources out there that can guide us through Advent and other seasons of the Christian calendar. 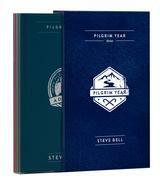 If you haven’t seen it yet, I invite you to check out Steve Bell’s new collection called the Pilgrim Year. My family plans on using his Advent guide this coming Sunday.